Design and create Response Group workflows, in Skype for Business Server Enterprise Voice. Both hunt group workflows and interactive workflows are covered. A workflow defines the behavior of a call from the time that the phone rings to the time that someone answers the call. The workflow specifies the queue to use for holding the call, and specifies the routing method to use for hunt group workflows or the questions and answers to use for interactive response group workflows. A workflow also defines settings such as a welcome message, music on hold, business hours, and holidays. Log on as a member of the RTCUniversalServerAdmins group, or as a member of one of the predefined administrative roles that support Response Group. In the left navigation bar, click Response Groups, and then click Workflow. In the Select a Service search field, type all or part of the name of the ApplicationServer service that hosts the workflow that you want to create or change. In the resulting list of services, click the service that you want, and then click OK. The Response Group Configuration Tool opens. You can also open the Response Group Configuration Tool directly from a web browser by typing the following URL: https://<webPoolFqdn>/RgsConfig. Under Create a New Workflow, next to Hunt Group, click Create. Under Manage an Existing Workflow, locate the workflow you want to change, and then under Action, click Edit. If you are ready for users to start calling the workflow, select Activate the workflow. If you are creating a managed workflow, you need to select Activate the workflow. After you save the active, managed workflow, you can then modify and deactivate it. To allow federated users to call the group, select the Enable for federation check box. You must also have an external access policy that applies to the Response Group application configured for federation. The global external access policy applies to the Response Group application. You can configure the global policy for response group federation by using Skype for Business Server Control Panel or by using the Set-CsExternalAccessPolicy cmdlet to set the EnableOutsideAccess parameter to True. Keep in mind that global policy settings apply to all users unless they are assigned a site or user policy. Therefore, before changing this setting for response groups, make sure that the federation setting meets the requirements of your organization. For details about how policies apply to users, see Manage External Access Policy for Your Organization. For details about the federation setting, see Set-CsExternalAccessPolicy. Users who are hosted in Skype for Business Online can't place calls to response groups that are hosted in an on-premises deployment. This is true in both hybrid deployments and in cases where an on-premises deployment is federated with a Skype for Business Online deployment. To hide the identity of agents during calls, select the Enable agent anonymity check box. Anonymous calls cannot start with instant messaging (IM) or video, although the agent or the caller can add IM and video after the call is established. An anonymous agent can also put calls on hold, transfer calls (both blind and consultative transfers), and park and retrieve calls. Anonymous calls do not support conferencing, application sharing and desktop sharing, file transfer, whiteboarding and data collaboration, and call recording. Agents using the Lync VDI Plugin can receive incoming calls anonymously, but they cannot make outgoing calls anonymously. Under Enter the address of the group that will receive the calls, type the primary SIP uniform resource identifier (URI) address of the group that will answer calls to the workflow. The primary URI for a workflow is how the workflow is identified and referenced. The SIP URI that you enter is created as a contact object in Active Directory Domain Services. To create the URI, the object must be unique in Active Directory. In Display name, type the name that you want to display for the workflow (for example, Sales Response Group). Do not include the "<" or ">" characters in the display name. Do not use the following display names because they are reserved: RGS Presence Watcher or Announcement Service. Under Telephone number, type the line URI for the response group (for example, +14255550165). In Display number, type the number as you want it to appear for the response group (for example, +1 (425) 555-0165). (Optional) In Description, type a description for the workflow as you want it to appear on the contact card in Skype for Business. a. Type the SIP URI of a manager for this workflow, and click Add. b. Type the SIP URI of additional managers to add to the workflow, and click Add. Every user who is designated as a manager of a response group must be assigned the CsResponseGroupManager role. If users are not assigned this role, they cannot manage response groups. Under Step 2 Select a Language, click the language that you want to use for speech recognition and text-to-speech. Do not include HTML tags in the text you enter. If you include HTML tags, you will receive an error message. To use a wave (.wav) or Windows Media audio (.wma) file recording for the welcome message, click Select a recording. If you want to upload a new audio file, click the a recording link. In the new browser window, click Browse, select the audio file that you want to use, and then click Open. Click Upload to load the audio file. All user-provided audio files must meet certain requirements. For details about supported file formats, see Technical Requirements for Response Groups. Under Step 4 Specify Your Business Hours, in Your time zone, click the time zone for the workflow. To use a predefined schedule of business hours, click Use a preset schedule, and then select the schedule you want to use from the drop-down list. You must have defined at least one preset schedule previously to be able to select this option. You define preset schedules by using the New-CSRgsHoursOfBusiness cmdlet. For details, see (Optional) Define Response Group business hours in Skype for Business. When you select a preset schedule, Day, Open, and Close are automatically filled with the days and hours that the response group is available. To use a custom schedule that applies only to this workflow, click Use a custom schedule. If you are creating a custom schedule for this workflow, click the check boxes for the days of the week that the response group is available. If you are creating a custom schedule, type the Open and Close hours for each day of the week that the response group is available. The Open and Close hours must be in 24-hour time notation. For example, if your office works a 9-to-5 work day and closes at noon for lunch, the business hours are specified as Open 9:00, Close 12:00, Open 13:00, and Close 17:00. To enter the message as text that is converted to speech for the caller, click Use text-to-speech, and then type the message in the text box. All user-provided audio files must meet certain requirements. For details about supported audio file formats, see Technical Requirements for Response Groups. To forward the call to voice mail, click Forward to voice mail, and then type the voice mail address. The format for the voice mail address is <username>@<domainName> (for example, bob@contoso.com). To forward the call to another user, click Forward to SIP URI, and then type a user address. The format for the user address is <username>@<domainName>. To forward the call to another telephone number, click Forward to telephone number, and then type the telephone number. The format for the telephone number is <number>@<domainName> (for example, +14255550121@contoso.com). The domain name is used to route the caller to the correct destination. You need to define holidays and holiday sets before you configure the workflow. Use the New-CsRgsHoliday and New-CsRgsHolidaySet cmdlets to define holidays and holiday sets. For details, see (Optional) Define Response Group holiday sets in Skype for Business. Under Step 6 Configure a Queue, in Select the queue that will receive the calls, select the queue that you want to hold callers until an agent becomes available. To use the default music-on-hold recording, click Use default. To use an audio file recording for the music on hold, click Select a music file. If you want to upload a new audio file, click the a music file link. In the new browser window, click Browse, select the file that you want to use, and then click Open. Click Upload to load the audio file. All user provided audio files must meet certain requirements. For details about supported audio file formats, see Technical Requirements for Response Groups. $promptWM = New-CsRgsPrompt -TextToSpeechPrompt "<text for TTS prompt>"
$promptWM = New-CsRgsPrompt -TextToSpeechPrompt "Welcome to Contoso. Please wait for an available agent." To use an audio file for the prompt, use the Import-CsRgsAudioFile cmdlet. For details, see Import-CsRgsAudioFile. For details about creating the queue, see New-CsRgsQueue. For hunt group workflows, the default action must direct the call to a queue. This parameter is required for active workflows. It is not required for inactive workflows. If you want to define business hours and holidays, you need to create them before you create or modify the workflow. For details, see (Optional) Define Response Group business hours in Skype for Business and (Optional) Define Response Group holiday sets in Skype for Business. If you want to have prompts for calls that are received out of business hours or on holidays, use the New-CsRgsPrompt cmdlet to define the prompt, and use the New-CsRgsCallAction to define the action to be taken after the prompt. For details, see New-CsRgsPrompt and New-CsRgsCallAction. $workflowHG = New-CsRgsWorkflow -Parent $serviceID -Name "Human Resources" -Description "Human Resources workflow" -PrimaryUri "sip:humanresources@contoso.com" -LineUri "TEL:+14255551219" -DisplayNumber "555-1219" -Active $true -Anonymous $true -DefaultAction $actionWM -EnabledForFederation $false -Managed $true -ManagersByUri "sip:bob@contoso.com", "mindy@contoso.com"
All users who are designated managers for workflows must be assigned the CsResponseGroupManager role. You can use interactive voice response (IVR) to obtain information from callers and direct the call to the appropriate queue. Question-and-answer pairs determine which queue to use. Depending on the caller's response, the caller either hears a follow-up question, or is routed to the appropriate queue. The IVR questions and the caller's responses are provided to the responding agent who accepts the call, providing valuable information to the agent. The Response Group application offers speech recognition and text-to-speech capabilities in 26 languages. You can enter IVR questions using text-to-speech or a wave (.wav) or Windows Media audio (.wma) file. Callers can respond by using voice or dual-tone multifrequency (DTMF) responses. Interactive workflows support up to two levels of questions, with each question having up to four possible answers. The IVR asks the caller a question, and depending on the caller's response, routes the caller to a queue or asks a second question. The second question can also have four possible answers. Depending on the answer to the second-level question, the caller is routed to the appropriate queue. When you design call flows by using Skype for Business Server Management Shell, you can define any number of levels of IVR questions and any number of answers. However, for caller usability, we recommend that you not use more than three levels of questions, with not more than five answers each. In addition, if you design a call flow that has more than two levels of questions with more than four answers each, you cannot edit the call flow by using Skype for Business Server Control Panel. The IVR questions and the caller's responses are provided to the responding agent who accepts the call. The speech engine gives the caller five attempts to answer the question. If the caller answers the question incorrectly (that is, the answer is not one of the specified responses) or does not provide an answer at all, the caller gets another chance to answer the question. The caller has five attempts to answer the question before being disconnected. You can configure the IVR to play a customized message after each caller error. The question is repeated each time. To minimize the potential for ambient noise to be interpreted by the speech engine as a response, use longer responses. For example, responses should have more than one syllable and should sound significantly different from each other. If your questions have both speech and DTMF responses, configure the speech responses with words that represent the concept rather than the DTMF response. For example, instead of using "Press or say one" use "Press 1 or say billing." After you design your IVR, call the workflow, listen to the prompts, respond to each of the prompts using voice, and verify that the IVR sounds and behaves as expected. You can then modify the IVR to fix any interpretation issues. Following the previous example, if you need to refer to the # key, you can rewrite your IVR prompt to use the key name, rather than the # symbol. For example, "To talk to sales, press the pound key." The following sections contain examples of different IVR scenarios and question-and-answer pairs. The following example shows an IVR that uses one level of questions. It uses speech recognition to detect the caller's response. 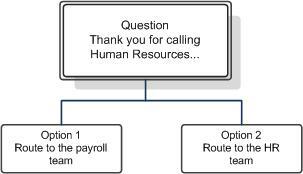 Question: "Thank you for calling Human Resources. If you would like to speak to payroll, say payroll. Otherwise, say HR." Option 1 is selected: The caller is routed to the payroll team. Option 2 is selected: The caller is routed to the human resources team. The following figure shows the call flow. The following example shows an IVR that uses two levels of questions. It allows callers to respond using either speech or DTMF keypad input. Question: "Thank you for calling the IT Help Desk. If you have a network access problem, press 1 or say network. If you have a software problem, press 2 or say software. If you have a hardware problem, press 3 or say hardware." Option 1 is selected: The caller is routed to the network support team. Question: "If this is an operating system problem, press 1 or say operating system. If this is a problem with an internal application, press 2 or say internal application. Otherwise, press 3 or say other." Option 1 is selected: The caller is routed to the operating systems support team. Option 2 is selected: The caller is routed to the internal applications support team. Option 3 is selected: The caller is routed to the software support team. Question: "If this is a printer problem press 1. Otherwise, press 2." Option 1 is selected: The caller is routed to the printer support team. Option 2 is selected: The caller is routed to the hardware support team. Let the caller get to the task quickly. Avoid providing too much information or lengthy marketing messages in your IVR. If you want to include a lengthy message, consider appending it to the first question instead of to the welcome message. Callers can bypass the message if it is part of the first question by answering the question, but they cannot bypass the welcome message. Speak in the caller's language. Avoid stilted language. Speak naturally. Write efficient and effective prompts. Remove any unnecessary options. Structure the information so that the caller's expected response is at the end of the sentence. For example, "To speak to the sales team, press 1." Make voice responses user friendly. For example, if you specify both DTMF and voice responses, use something like: "To speak to the sales team, press 1 or say sales." Test the IVR on a group of users before you deploy it across your organization. In the Select a Service search field, type all or part of the name of the ApplicationServer service that hosts the workflow that you want to create or modify. In the resulting list of services, click the service that you want, and then click OK. Under Create a New Workflow, next to Interactive, click Create. If you are not ready for users to start calling the workflow, clear the Activate the workflow check box. The global external access policy applies to the Response Group application. You can configure the global policy for response group federation by using Skype for Business Server Control Panel or by using the Set-CsExternalAccessPolicy cmdlet to set the EnableOutsideAccess parameter to True. Keep in mind that global policy settings apply to all users unless they are assigned a site or user policy. Therefore, before changing this setting for response groups, make sure that the federation setting meets the requirements of your organization. For details about how policies apply to users, see Manage External Access Policy for Your Organization. For details about the federation setting, see Set-CsExternalAccessPolicy in documentation.. In Display name, type the name that you want to display for the workflow (for example, Sales IVR Response Group). In Telephone number, type the line URI for the response group (for example, +14255550165). (Optional) In Description, type a description for the workflow that you want to appear on the contact card in Skype for Business. Under Step 2 Select a Language, click the language to use for speech recognition and text-to-speech. Under Step 4 Specify Your Business Hours, in the Your time zone box, click the time zone of the workflow. You must have defined at least one preset schedule previously to be able to select this option. You define preset schedules by using the New-CsRgsHoursOfBusiness cmdlet. For details, see (Optional) Define Response Group business hours in Skype for Business. When you select a preset schedule, Day, Open, and Close are automatically filled with the days and hours that the response group is available. If you are creating a custom schedule, type the Open and Close hours when the response group will be available. To use the default music on-hold recording, click Use default. To use an audio file recording for the on-hold music, click Select a music file. If you want to upload a new audio file, click the a music file link. In the new browser window, click Browse, select the file that you want to use, and then click Open. Click Upload to load the audio file. To enter the question in text format, click Use text-to-speech, and type the question in the text box. The "#" symbol is translated by the text-to-speech engine as the word "number". If you need to refer to the # key, you should use the key name, rather than the symbol, in your prompt. For example, "To talk to sales, press the pound key." To use a prerecorded audio file that contains the question, click Select a recording, and then click the a recording link to upload the file. In the new browser window, click Browse, select the audio file, and then click Open. Click Upload to load the file, and then optionally you can type the question in the text box (this enables the question, and the caller's response, to be forwarded to the responding agent). Do not use quotation marks (") in any voice responses. Quotation marks cause the IVR to fail. You can choose to allow callers to answer using speech, alphanumeric keypad input, or both. If you want to allow the caller to respond using speech, enter the answer in Enter a voice response. If you want to allow the caller to respond by pressing a key on the keypad, in Digit, click the keypad digit. To route the caller to a queue, click Send to a queue, and in Select a queue, click the queue that you want to use. To ask another question, click Ask another question, and then click Use text-to-speech and type the question, or click Select a recording. Use the response groupings in this section to specify up to four possible responses to the additional question and the queue to use for each response. To specify a third or fourth possible response, click the Response 3 check box or the Response 4 check box. Specify up to three more possible answers to the original question by repeating steps 28 and 29 to specify the possible responses and the action to take for each response. To specify a third or fourth possible answer, click the Response 3 check box or the Response 4 check box. $SupportPrompt = New-CsRgsPrompt -TextToSpeechPrompt "Please be patient while we connect you with Contoso Technical Support." $SalesPrompt = New-CsRgsPrompt -TextToSpeechPrompt "Please hold while we connect you with Contoso Sales." $TopLevelPrompt = New-CsRgsPrompt -TextToSpeechPrompt "Thank you for calling Contoso. For Technical Support, press 1. For a Sales Representative, press 2." All users who have been designated as manager of a response group must be assigned the CsResponseGroupManager role. If users are not assigned this role, they cannot manage response groups.